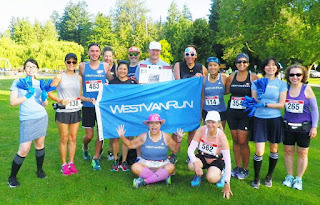 Yesterday was the Summerfast 10K, the annual flat and fast 10K around Stanley Park hosted by the Vancouver Falcons Athletic Club. Their fearless leader, Coach John Hill, coached me once upon a time, so I like to support this race as often as I can. I had to miss it last year because we were out of town, but I was pleased to be able to run it again this year. 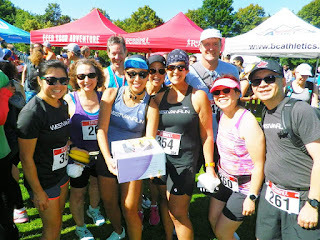 As always, it was a beautiful sunny day to enjoy the scenic race route, the race was flawlessly organized by the club members and the post race party was not only fun, but included delicious home baking! Running this race yesterday for me was all about completion and very little about finish time. I achieved my goal of finishing strong without any suggestion of pain in my knee or anywhere else in my body for that matter, and with plenty of steam still left in me. This was not a race about pushing my body to its maximum to achieve the best time. It was just me wanting to complete 10K 100% strong, and all me. I achieved these things indeed and I am so happy about that. My return to running after my daughter was born started at 4 weeks post-partum. I was slow and sluggish but running felt good. If I am honest though, I pushed myself to do distance work a bit too soon as I hadn't completely healed from child birth. I should have stuck to shorter runs. Hindsight is always 20/20, but I completed a 10K in March and likely shouldn't have done that. That race was a struggle the entire way and I don't think there's any denying that pushing myself through this race and in my training leading up to it is likely what led to my knee injury soon after that benched me for another 6 weeks. I hated that 6 weeks off running, but now that I look back, it was perfect. Again, that hindsight! This time off forced me to rest my body and while I was healing my knee, the rest of me got a chance to heal. When I started running again in May, I was starting from scratch, taking baby steps as a beginner would. This process was really tough on me mentally and emotionally, but I also knew that it would be temporary and I'd be running for real soon. My approach was gentle and gradual, which bored me, but also motivated me. I was seeing progress rapidly. Summerfast was always an idea in my mind, but I did not register or commit to the idea until I was absolutely certain that I was ready. My first realization that I was ready was when I ran 7km with the stroller. Stroller runs are always harder, and this run was particularly hilly, and I did it without any hint of struggle. The following week I planned an 8km, but ended up doing 9km with my sister-in-law in Victoria. I registered for Summerfast after completing this run, only a couple weeks before the event took place. When it comes to finish time, the thing is that I didn't know what goal time to set. This wasn't a typical race for me as I would have set out to do pre-baby. I hadn't completed 10K+ distances multiple times in my training. I hadn't done any speedwork. I had no recently completed race efforts to gauge my fitness. All I had done were a few training runs, all shorter than 10K, all at an easy pace that gave me the confidence I could do 10K. 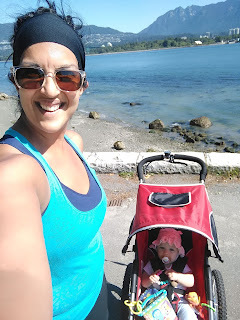 The closest I got to 10K was my "dress rehearsal" run the week before, running around Stanley Park with my daughter in the stroller (9.5K total). 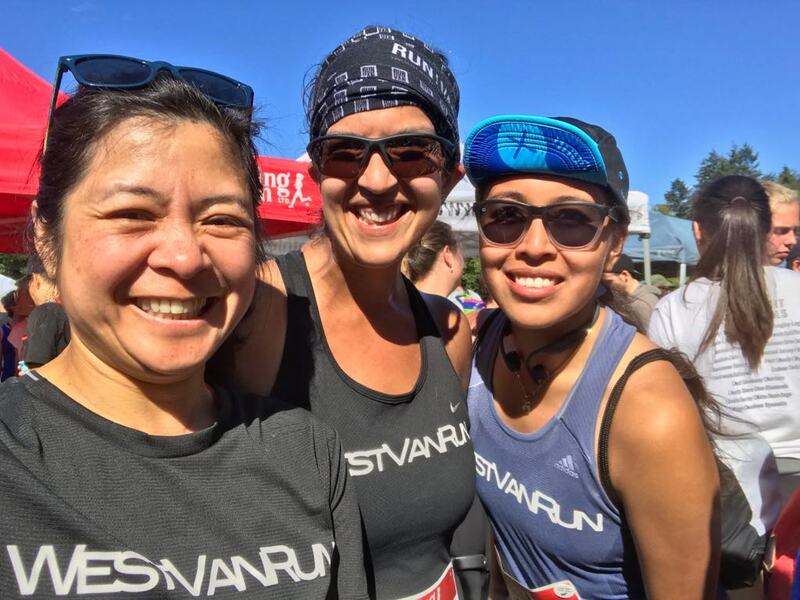 We ran around Stanley Park together the week before the race! I wanted to give her the experience of seeing the entire seawall. Boy did she love it! I wanted to push myself and see if I could run that far pushing the stroller - it was hard work, but the right amount of challenge! I hadn't run the entire seawall in some time and thought some visual reminders before the race would benefit me (and they did). I knew what was around every corner, and I had the added bonus of cute memories of my daughter to help me through on race day. When the race started, I didn't know what pace to aim for. In all my training runs in the last two months since I started running again, I have not been paying attention to pace because it's all been about just getting it done. I've been in the "easy miles" mindset the whole time. Of course that's all relative, because I can run a good minute/km faster when I am not pushing the stroller (or something like that). But it had been some time since I had run without a stroller. I had also not run so early in the morning in a long time when the temperatures are cooler and friendlier as I run according to my daughter's schedule. I thought to myself to aim for a 7:00/km. I fell slightly short of this at a 7:04 average pace, but this is OK considering it was just a ballpark projection, rather than a goal I had any investment in sticking to. The only reason to set a projection was to ensure I didn't push myself too hard at the race. I feel I pushed just the right amount. I finished in just over 71 minutes. In case you're wondering, my best 10K is about 20 minutes faster than this. But I am super proud of my 71 minute finish. Why? Because 71 is a whole lot faster than the 78 it took me to complete that race in March that I struggled through. Because I defeated odds against me to get to this result with my comeback from childbirth and a knee injury. Because I finished strong and with plenty of gas left in the tank. Because this race gave me the confidence that I can now take my training to the next level. I can be a distance runner again, and I can turn up the heat and be faster than I was today, but all in due time. I feel different today than I did when I first returned to running post-partum. I was running then because it was familar and ultimately what I wanted to return to. But it was hard and my body felt foreign to me. I feel different today than I did when I returned to running post-injury. I was deflated and hated to return like a beginner. Today I can run pain-free. Even though I am slower than I used to be, I don't feel slow. I feel strong, empowered, and like I can do anything I put my mind to. I'm also getting closer to my pre-baby self. Since I have stopped nursing, I fit into my pre-baby sports bras again and running is so much more comfortable without the added weight up top. I am noticing that I am regaining muscle that I had lost and slowly and surely leaning out. My legs are starting to look and act like runners legs again. I will be cautious about pushing too hard; I don't want to make that mistake again. But I want to try increasing my distance gradually and soon start incorporating a small amount of speedwork into my training week. Perhaps my next half marathon is in my not-too-distant future. Perhaps even by this fall, if all goes well. I'll keep you posted! 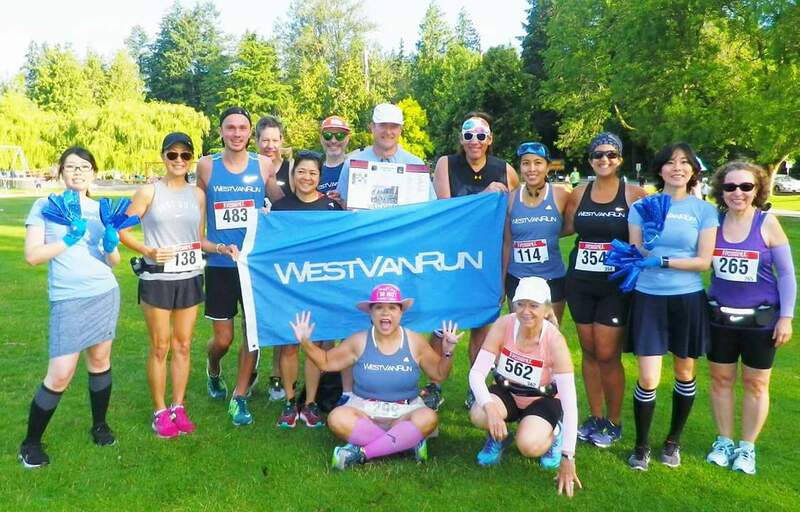 I registered to complete this race as a member of the West Van Run crew as there is a "crew challenge". I don't normally join teams when I race as I train mostly on my own, but this gave me a nice social aspect to the race to look forward to. Our crew isn't the fastest, but being a big group, we managed to come in 2nd in the challenge. I also scored some sweet swag as I won one of the draw prizes at package pickup - some sweet new Sundog sunglasses! I loved wearing these at the race as they did not slip off my nose at all! They will be awesome training this sunny summer. 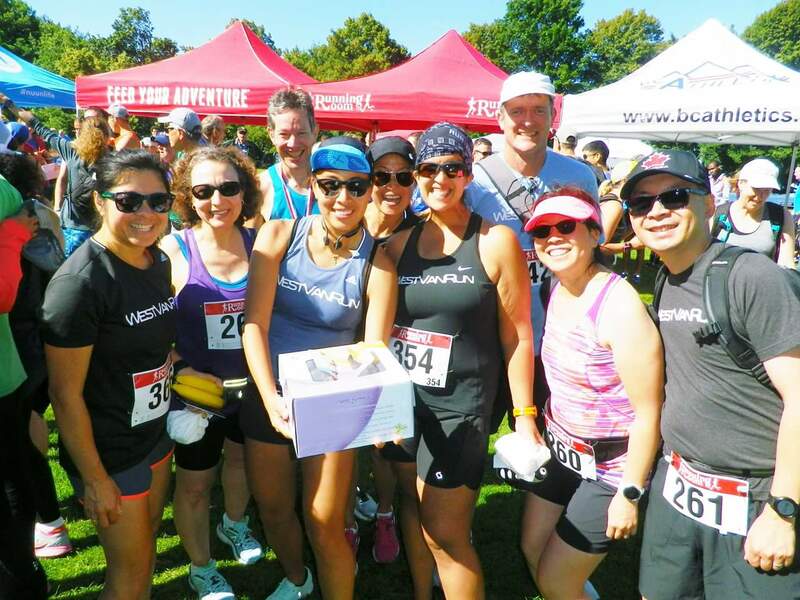 And at the post-race party, one of my crew-mates won a voucher for Moveo Physiotherapy clinic here in North Vancouver which he said he had no use for. I sheepishly told him that I'd use it if he didn't want it. So he handed it over and I am excited to use it. I love my PT, but a freebie and a second opinion is never a bad thing. I plan to get my knee re-assessed now that I've been running a while, and ensure I do what I need to do to ensure it remains strong in the long haul.